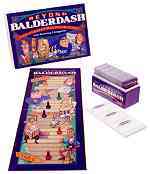 Click here to go to the UK Balderdash Games page. Bluff and guess your way to the top! Learn unusual words you never knew. Includes scoreboard, counters, dice, 1000s of definition cards, and answer slips. Requires at least four players. Recommended age: 9 years and up. Extension of the classic board game Balderdash. Five question categories: words, people, initials, movies, & dates. Includes scoreboard, counters, dice, 1000s of question cards, and answer slips.